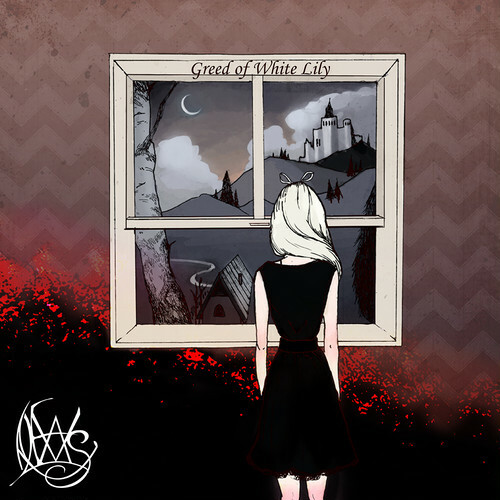 Greed of White Lily(mp3+CD quality WAV)Download. One of promising Japanese melodic progressive metal combo leaning towards Dream Theater has come out to us. A Japanese outfit ALEVAS were founded as a melodically metallic rock quartet by SAKAKI (guitars), YUJI (bass), TOMO (drums), and KENGO (voices), all of whom have tremendously got inspired by Dream Theater. "Greed Of White Lily" has been launched as their debut creation upon January 9, 2018, that obviously has lyrical melodic sensitivity mixed with complicated polyrhythmic explosion. Actually they've been introduced to me by their musical friend Yuji MUTO (Next Order) who will join as a guest guitarist for their coming album, and their excerpt of this album completely clutched my heart. Let me say every metal fan would get immersed in their composition, production, playing technique, and especially strong intention for this creation. The first shot "Ruined Castle" should be called as a credential. On the perfect basis by the rhythm section (Tomo and Yuji), Sakaki's crying guitar play is quite comfortable and addictive (anyway Sakaki's crazy learned jazz guitar technique in his adolescent days amazingly). Dramatic texture must absorb the audience in a dynamic manner. Th following track "Human Node', featuring all of their artistic characteristics, reminds me like Dream Theater meets Opeth. Kengo's colourful voices are perfectly crystallized upon this turf. Not only progressive lines but also pop elements can be heard all over the tune. The similar vein to acceptable power metal can be grabbed via 'Abstract Eternity" filled with clear voices, sharp guitar edges, and swift powerful drumming. Can hear Petrucci-like speed guitar phrases in the middle of "In The Vortex" where sensitive catchiness is never forgotten. Dreamy, streaming, floating movements e.g. in "Blue To Be Swallowed' should be enjoyed along their musical stability. "Naraka', another masterpiece of theirs, has exaggeratedly mysterious touches and sorta metallic core seasoned with influence by lots of pioneers belonging to various progressive metal subgenres. We can feel of black. death, power metal arrays. Like "Human Node', every single essence of ALEVAS we can keep in our brain. Until the last inorganic footprint in kinda tragic epilogue "Endless Promenade' we cannot breathe enough. A fantastic debut creation although their innovative originality cannot felt enough. Currently they are just working for the second full- length album in a studio. Cannot wait really.